This is one of Florida’s premier birding and wildlife viewing sites. Famed author and naturalist William Bartram explored the vast Paynes Prairie in 1774 and dubbed it the “great Alachua Savanna.” Today this spectacular park encompasses nearly all of the 16,000-acre basin marsh and wet prairie, plus hardwood hammocks, flatwoods, swamps, lakes and streams. There are 8 trails including the paved mutli-use, 16-mile Gainesville-Hawthorne Trail. The main entrance on Savannah Blvd. has a staffed visitor center with interpretive exhibits and an audiovisual program. Stop here, pick up a map and check for recent sightings; loaner optics are available if you need them. The LaChua Trail offers winter sparrow habitat, hawks, winter waterfowl, and access to the prairie wetland. The Bolen Bluff Trail winds through a hardwood forest frequented by warblers from fall through spring, and leads to a viewing platform on the prairie. 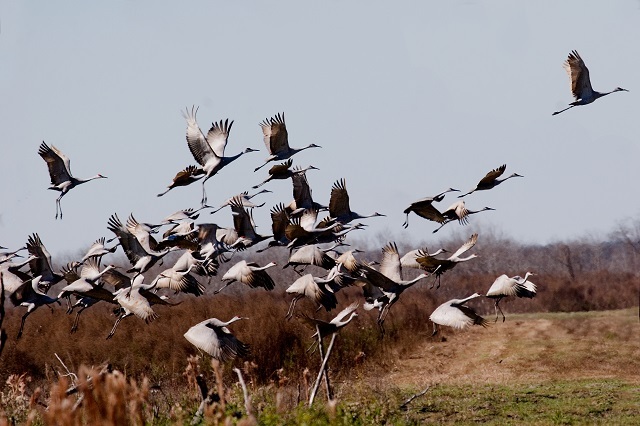 Large numbers of migratory Sandhill Cranes winter here, from November to March; Florida Sandhill Cranes are present all year, and in winter, Whooping Cranes may be present. Among the 270 species of birds on the park checklist are Limpkin, Purple Gallinule, King Rail and rarities such as Yellow Rail, Tundra Swan, White-faced Ibis, Golden Eagle, Groove-billed Ani, Vermilion Flycatcher, and Harris’s Sparrow. Watch for the park’s herd of American Bison, plus many huge American Alligators. Butterfly viewing is excellent at this park. Pets are not allowed on the LaChua Trail, Bolen Bluff Trail or the Cone’s Dike Trail.